The Times of Malta carried a report Sunday of the publication of Notes of Maltese Civil Law, by “the Department of Legal History and Methodology within the Faculty of Laws at the University of Malta.” Edited by President Emeritus Ugo Mifsud Bonnici, the book publishes the transcribed lecture notes of Giovanni Caruana (1866-1923). 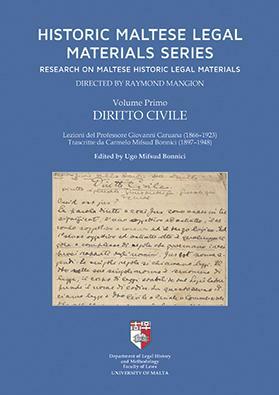 It is part of "Historic Maltese Legal Materials Series." More.